In response I heartily suggest the mixing of a shot of espresso* into a bowl of quick cook oatmeal**. 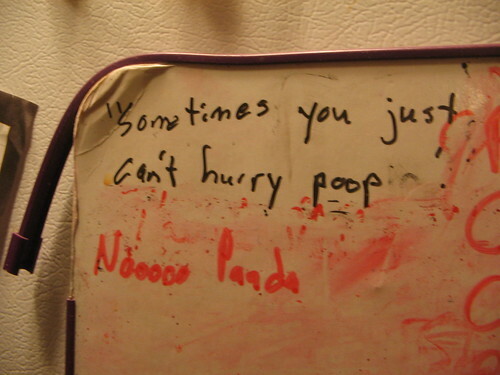 Believe me when I tell you that it will most definitely hurry poop. * Caffeine can stimulate accelerated peristalsis in the digestive tract, so that your intestines push out more waste faster. Doctors, back me up on this. ** Oatmeal is loaded with fiber, which, as you may know, makes you poop.